On September 20th, 2014 #HeForShe was launched by the UN Secretary, General Ban Ki moon and UN Women Global Goodwill. Ambassador Emma Watson, along with hundreds of thousands of supporters from around the world including Heads of State, CEOs, global luminaries, and may others like me have committed to gender equality. In September 2017 and following up the direction approved by the 2016 Convention, 2016-2018 Zonta International President Sonja Hönig Schough announced Zonta International’s support for UN Women’s HeForShe campaign, a global movement that aims to mobilize 1 billion men to accelerate the achievement of gender equality. Recognizing that gender equality is not a women’s issue, but a human rights issue. December 10this Human Rights Day. The links below provide education and tools to help men and boys to identify what matters to them and what they will do to contribute to gender equality. Individuals, organizations and students can take advantage of the tool kits that facilitate the transition from awareness to action, and thus increase the participation and commitment of men and boys to change the world and to achieve gender equality in this 21st century! Implement the Marriage, Divorce and Family Relations Act (Marriage Act) of 2015. Currently, 1 in 2 Malawian girls is married before her 18th birthday. By passing the groundbreaking Marriage Act this year, Malawi took an important step towards ending child marriage. Malawi commits to fully implement this law over the next five years. Malawi has already established a dedicated Task Force on Ending Child Marriage which will report directly to the President. 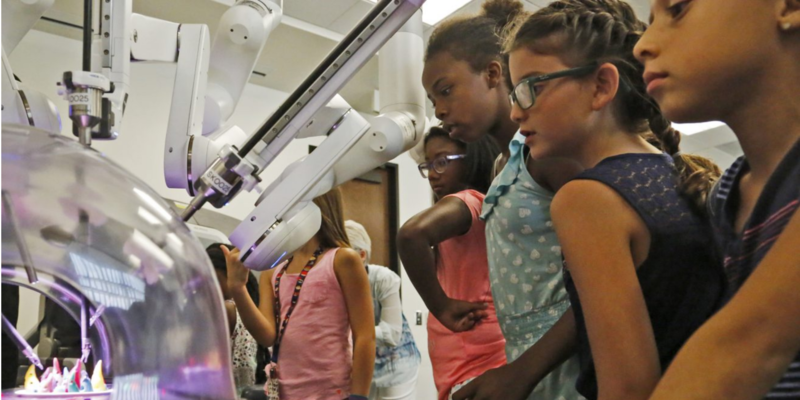 The Task Force will have several key responsibilities: collect and report data on the average marriage age, escalate challenges or lagging progress, and convene stakeholders from across the country. Additionally, the Government will establish Marriage Courts at district level to handle the case and monitor the implementation of the Act. Finally, the government commits to amending the register of marriage. Increase by 30% the number of women accessing credit. Women constitute 70% of informal traders in Malawi, but today, the majority of these women cannot access credit, own land, or control production resources. Thus, women remain excluded from the formal economy: a recent study found that only a third of Malawian women participated in the formal labor force. The Government of Malawi will work closely with commercial banks to create a foothold in the banking system for these women. By 2016, all commercial banks will develop new lending products and options to support and empower women. A national platform for women’s economic empowerment will overview the implementation with CSOs and Government. At the same time, Women Economic Empowerment will become a core priority area of the new Malawi Growth and Development Strategy III (2016 – 2020) and the “Women’s Development Fund’ will be established to support the implementation of the strategy with a target to increase by 30% the number of women—and in particular, rural-based women—accessing credit. Implement the National Action Plan on GBV (gender-based violence) and the by-laws on ending violence against women and girls. Violence is a widespread but silent epidemic in Malawi today: an estimated 1 in 5 girls and 1 in 7 boys have experienced sexual violence, but most violence occurs in the home and is viewed as a private family affair, with very few reported cases. To shift the tide on violence, the Government of Malawi first aims to increase the number of reported cases of gender-based-violence by setting up a mechanism within the National Action Plan on GBV, to bring this issue into the spotlight. The government will strengthen the 300 community based victim support units and build their capacity to handle cases in coordination with law enforcers and judiciary. In addition a Chief’s Committee will be established to consolidate standardized bylaws and follow on their implementation to promote positive norms around gender, violence and sexuality. "Violence against women is a worldwide pandemic - it crosses every social and economic class, every religion, race and ethnicity. At least one out of every three women worldwide have experienced violence during their lifetime. We in Zonta International cannot accept this – we need to use all our energy to eradicate violence against women locally and internationally through service and advocacy." Zonta International objectives state that we will promote justice and universal respect for human rights and fundamental freedoms, at the International and local levels. Violence against women and girls occurs at an alarming rate in communities across the globe. One out of three women will experience physical and/or sexual violence by a partner or sexual violence by a non-partner violence against women. 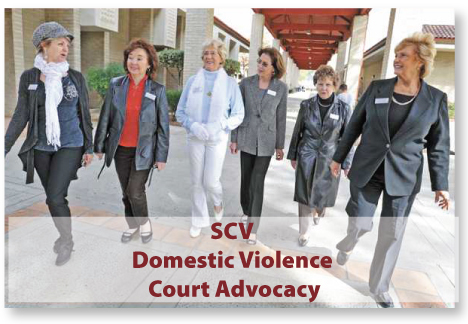 To bring awareness to the issue of Domestic Violence in our community we participate in the “Zonta Says No Campaign, in collaboration with the SCV Domestic Violence Center. The 16 days of Advocacy are held annually from November 25, December 10. 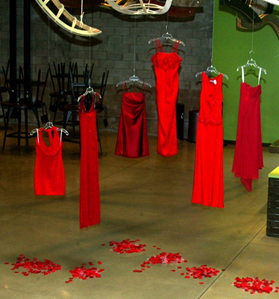 Since 2016 the “Zonta Says NO to Violence Against Women” campaign has included a display of seven red dresses around Santa Clarita to symbolize seven women who have lost their lives, in one year, to domestic violence in Santa Clarita. The dresses are displayed outdoors, in public places, where they become animated by the wind and weather. A haunting and inescapable symbol of bloodshed in of our community. Residents can see these dresses at many locations throughout the City. The locations are posted in November. These bright red symbols are meant to remind us of the reality of domestic violence – it may seem like a private matter, but it is happening in our neighborhoods to our fellow residents and cannot be ignored. We must all strive to be “up-standers, and not bystanders,” meaning we all need to speak up if we see or hear of domestic and family violence happening. Educational materials are available in English and Spanish. This program is in cooperation with the Domestic Violence Program of the Child and Family Center and the City of Santa Clarita. The Zonta club pays for its members, who are interested, to attend the 40 hour Domestic Violence training that is required, by law, to assist Domestic Violence victims. After the training the Zontians become Domestic Violence Advocates. Court Advocates write Temporary Restraining Orders and assists victims with the legal process and the court appearances, and Outreach advocates who assist victims to move forward with their lives through art and a mentor program.